All of our knife sheaths are made with top grade Muir & McDonald leather which is bark tanned leather that reduces the risk of rust and pitting on your knife blade. 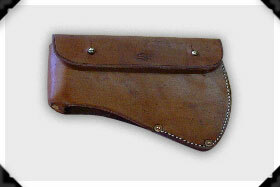 We can make a custom knife sheath for any size and shape of knife to meet your needs. 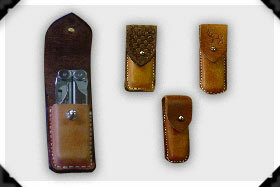 All sheaths come in brown, dark brown, and black colors and can be plain, border stamped, basket stamped, or floral carved. They also can be personalized with names, initials, brands etc. 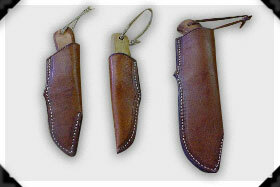 Left or right handed sheaths available. The custom Leatherman case can be made for any style Leatherman or other multi purpose tool, similar cases can also be made for any size folding knife. 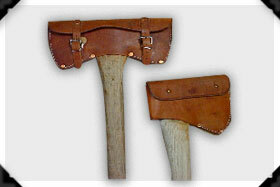 Custom axe sheaths can be made for any size and shape of axe. They come with choice of snap or stud to connect the flap and have dee rings on back to attach to saddles or packs. *Depending on size of knife and options chosen. $25.00 to $45.00 depending on size of hatchet.